This is Clytia gregaria, formerly known as Phialidium gregarium. The instructor of our Embryology class collected many adult individuals of this hydromedusa from the plankton off F-dock in the Charleston Marina Complex. I like cnidarians and I wanted to follow the development in this species. Adult C. gregaria is about 2 cm in diameter, and can be identified by its ruffled manubrium located in the center of the subumbrella (the underside of the bell). The four gonads are located along the radial canals of the digestive system (the thick white lines radially arranged on the underside of the bell). C. gregaria hydromedusae are present in the plankton from late spring to early fall. Recently collected hydromedusae of this species readily release eggs and sperm (typically, at the crack of dawn the day after collection), fertilization and embryonic development is external. 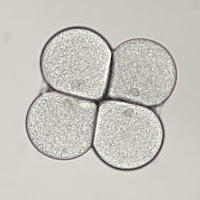 This is a 4-cell stage. As you can see the cells are all the same size, so the cleavage is equal. 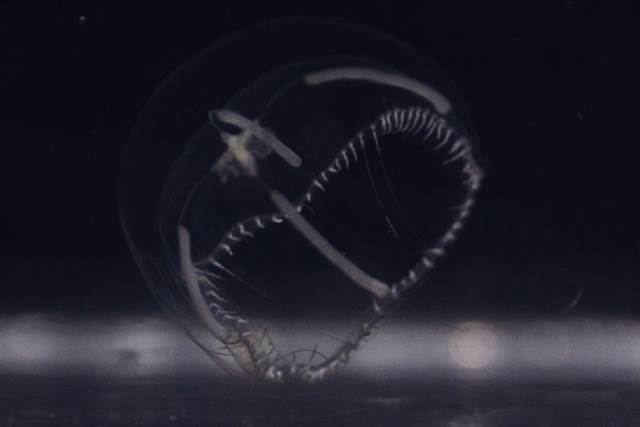 Clytia, like many hydromedusae, have transparent eggs which makes them convenient embryological study objects. 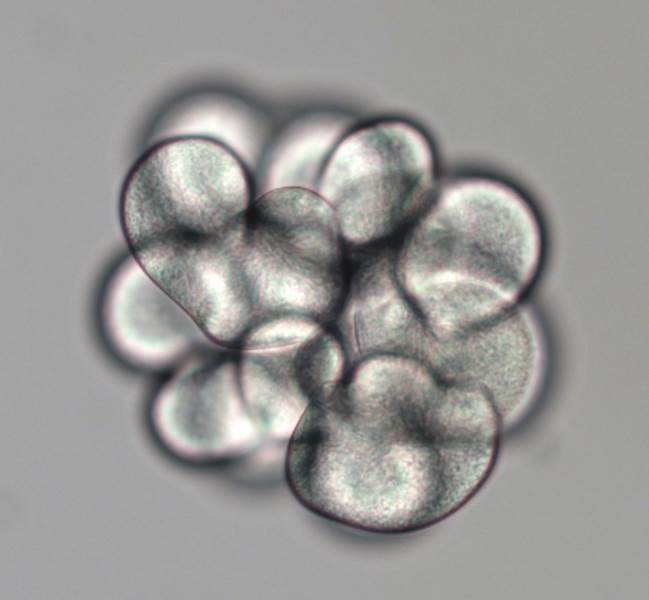 The four little spheres (one inside each cell) in this picture are the cell nuclei, visible thanks to the clear cytoplasm of these eggs. Cnidarians (and ctenophores) exhibit an unusual type of cell division illustrated here. 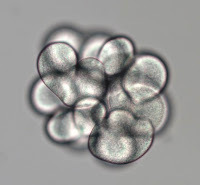 It is called unilateral cleavage, and means that cleavage furrow forms at one pole of the cell and progresses to the other pole, so the cells appear heart-shaped in mid-cleavage, as you can clearly see on this picture of a ~16-celled embryo. 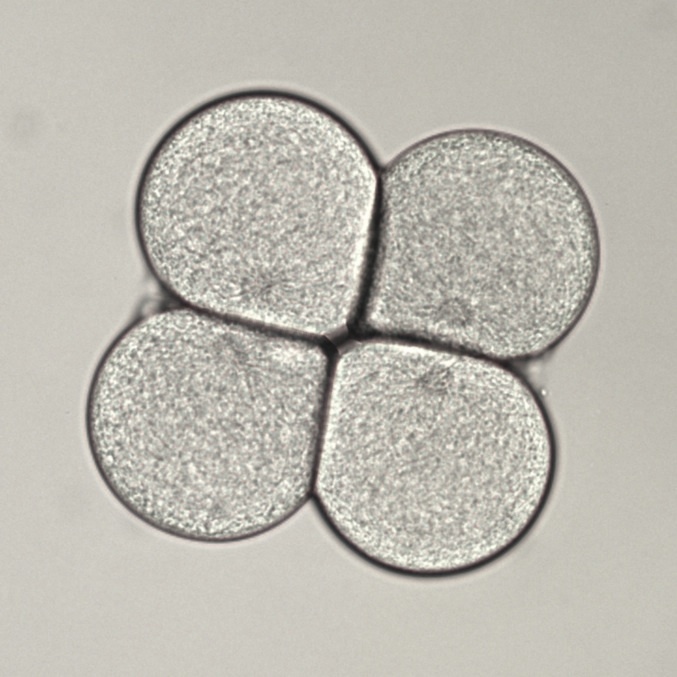 The site of initiation of first embryonic cleavage defines the oral end of the developing embryo. 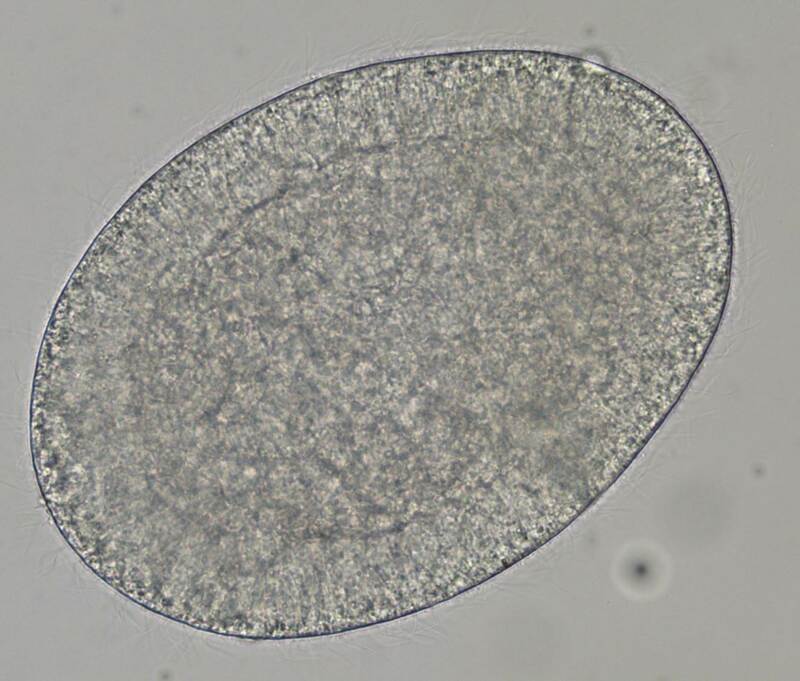 The embryo develops into a planktonic planula larva shown here. The planula larva is characteristic of most cnidarians. 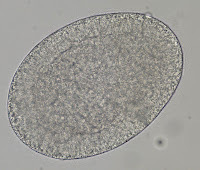 The hydrozoan planula is uniformly ciliated, oval-shaped, usually somewhat opaque, and lacking any appendages or defined gut (they do not feed). Hydrozoan planulae usually spend a short period in the plankton (days), then settle and undergo metamorphosis into a benthic polyp stage, the asexual generation in the life cycle of a hydrozoan.